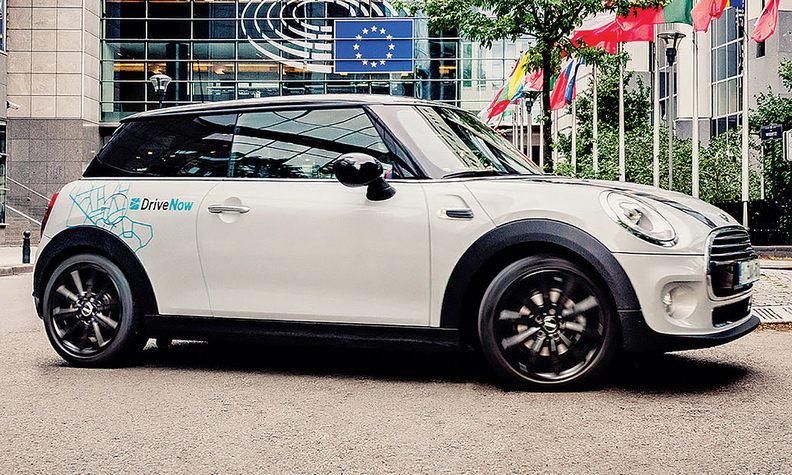 A BMW DriveNow car in Brussels. The car-sharing program is in 12 cities around the world. FRANKFURT -- Daimler and BMW aim to combine their car-sharing services Car2Go and DriveNow to better compete with U.S.-based ride-hailing service Uber, German monthly Manager Magazin reported, citing sources. DriveNow, a joint venture between BMW and Sixt founded in 2011, and Car2Go, started in 2008, plan to operate on a shared platform but to keep their individual brand names, the magazine reported. The two companies are also discussing including other mobility service providers in the venture, the magazine said, citing Daimler's taxi cab agent Mytaxi and its internet platform Moovel as well as BMW's ParkNow and ChargeNow brands. By banding together, the companies could thus steal a march on other potential rivals such as Uber, the report said. Daimler and BMW declined to comment on the report. But Sixt SE, which co-owns the DriveNow car-sharing venture with BMW, said it would oppose any plans to merge the unit with Car2Go. Sixt holds a 50 percent stake in BMW’s European car-sharing venture, which rents cars by the minute in cities such as Berlin, London and Milan. Software and technology companies such as Lyft, Juno and Uber have shaken up the traditional auto industry business model by offering customers an alternative to vehicle ownership through smartphone-based ride-hailing services. Daimler and BMW have for years been running their own car-sharing operations, which allow users to rent vehicles for short periods, but BMW now also plans to test self-driving cars in Munich in its latest push in the market for pay-per-use personal transport. An August report by research firm Frost & Sullivan estimated the global car-sharing market will grow from 7.9 million users in 2015 to 36 million members by 2025. Car2Go, which in October described itself as the world's largest one-way car-sharing service with over 2 million members worldwide, is available across eight countries in North America, Western Europe and in China, operating more than 14,000 vehicles. DriveNow operates roughly 5,390 vehicles across seven countries in Europe, serving over 750,000 customers.